Cover gaps in your Body Armor when riding in un-armored vehicles. We've combined one of the toughest and user-friendly backpacks out there, with our Level III-A ballistic protection to give you the ultimate Assault / Combat Pack (or order in non-Camo colors for civilian use). 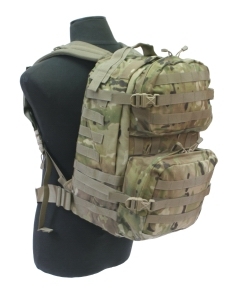 SpecOps makes a superb Assault Pack (more info at SpecOps) - the only way to improve it was to add Level 3A Aramid to provide protection from Fragmentation, pistol and 9mm sub-machine-gun threats..
You can even upgrade to rifle protection. For example, one of our Ultra-light Rifle Plates is a lightweight choice to upgrade from Level III-A to Level III rifle protection.